a spot of whimsy: pod 2012.
today i have something more personal but also pretty fantastic to share with those of you in the chicago area. 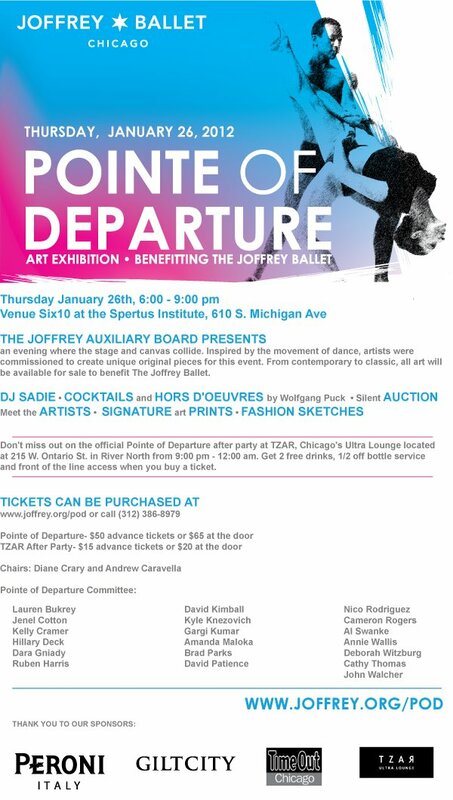 the second annual pointe of departure art exhibition (my recap of last year here) benefiting the joffrey ballet is just one week away! and this year i am honored to be the event's co-chair. outside of work, this event has definitely been my life for the last several months. it's an awesome responsibility and i am so proud of our committee and the event we have put together to benefit an organization we all love and care about. there will be beautiful works of art and the drinks will definitely be flowing. so come join me! it's a fabulous way to spend a wintery thursday night, if i do say so myself. tickets can be purchased here.